Eric Alatorre, the amazing basso profundo of the all-male vocal ensemble Chanticleer, has come down with laryngitis and is unable to anchor the group for this weekend's concerts. In an unprecedented move for the group, the bass part is going to be filled in by a cello. "This week laryngitis has taken Eric Alatorre's voice entirely – a very rare occurrence," writes a Chanticleer member on the organization's blog today. "Eric always refers to his vocal role as being the basement of the house. So we are, for this weekend, anyway, without a basement. 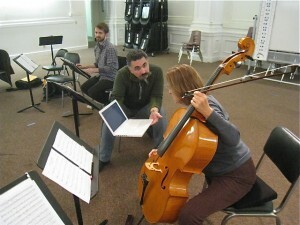 [Music Director] Matt Oltman had the idea of replacing some of that sonic structure with a cello. Laura McClellan (who sings with us at Sonoma [Chanticleer's summer workshop for adult singers of both sexes at Sonoma State University], sometimes ushers for us, and plays the cello) has turned up overnight to rehearse today for this unusual moment." Chanticleer members tend to soldier through illness. "The most frequently asked question of us is, what happens when somebody is sick?" the blogger continues. "Our answer – always delivered with considerable confidence- is – we sing anyway." On the rare occasions when a singer cannot perform, the group generally manages without him. Only once in her experience, says Chanticleer President and General Director Christine Bullin, has the ensemble had to bring in another vocalist. "I've only seen this happen once, when Chris Fritzsche was sick for the "Divine Tapestry" performances," says Bullin. "He was replaced by a female soprano, the wife of a Chanti-guy." "Eric is presently communicating only in writing," continues the blog post. "We'll be fine – and it will be an interesting experience for us, and we hope, for our audience." I'm going to the concert next weekend, by which time Eric's voice will hopefully be restored. Obviously I'm excited about hearing the works as they are meant to be heard, but I kind of wish I were going this weekend. And I'm envious of Laura McClellan. There can't be too many women out there who can claim to have performed in an all-male vocal ensemble.